OLFA Blades SKB-10/10B Model 1096855 concealed blade safety knife replacement blades helps reduce injuries in the workplace. Blades manufactured using OLFA's multi-step production process for superior sharpness and blade retention. Blunt edge for safer handling in blade positioning adjustment, and blade replacement. Each blade features 4 cutting edges. 10 pack contains 40 cutting edges. 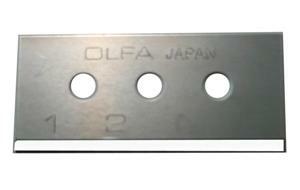 Replacement blades for OLFA SK-10 knife. Good for shrink wrap, plastic strapping, stretch wrap, plastic sheeting, bubble wrap, leather, nylon, belting, sacks, bags, tape slitting. OLFA Safety Knife SK-10 Model 1096854 Has A Concealed Blade That Delivers 4 Times More Cuts Than A Single-Edge, Fixed Blade "Gooseneck" Safety Knife. CLICK ON IMAGE AND SCROLL DOWN TO RELATED PRODUCTS FOR A LIST OF REPLACEMENT BLADES.